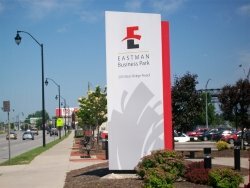 The Eastman Business Park (EBP) continues to increase its own brand awareness with newly updated monument signs in two key locations - - on the corner of West Ridge Road and Lake Avenue, and at the entrance of what is known as Building 28, located at 200 West Ridge Road. This is just one example of our ongoing efforts to market the site as a viable and attractive opportunity for businesses looking to relocate and/or expand in the Rochester area. We're working hard to ensure our message is received loud and clear....that the Eastman Business Park is unparalleled in its offerings and advantages to a wide variety of industrial and manufacturing tenants. Stay tuned for more exciting activities happening at Eastman Business Park, and be sure to share our story with others.